Stuart Gray insists there have been no tentative enquiries from other clubs over Keiren Westwood. Speculation is mounting that the Owls could be set for an intense battle during the January transfer window to hold onto the Irish keeper, who has been on a brilliant run of form since arriving at Hillsborough in the summer. But Gray says he has not received a single phone call about Westwood and is unconcerned about the growing talk over his potential departure. “Keiren has got a two year contract left so that gives me a great deal of confidence that he will still be here,” Gray said. “It’s all speculation and I don’t comment on speculation. “The one thing we do know is that Keiren Westwood has been playing outstandingly well. “He’s a fantastic keeper in the Championship. Six great Sheffield Wednesday goalkeepers - how does Keiren Westwood compare? The plaudits for Westwood have rarely dampened down during his first five months at the club. And that has meant the 30-year-old is being tipped as a name on the list of targets for several Premier League clubs during the January window. 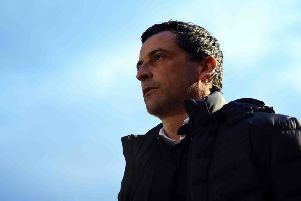 But Gray says the performances of Westwood’s team mates have only enhanced the view of the Republic of Ireland international’s form. He said: “I think Keiren would be the first to admit that it’s not just been down to him but the ten players in front of him as well. “When the opposition has got past those ten he’s pulled off some decent saves, some good saves, some outstanding saves and some world class saves. “We talk a lot about competition for places and Keiren knows he’s got Chris Kirkland behind him. “Chris is pushing and is desperate to get back into the team.